This is a foreign exchange guide to San Marino, the Euro currency plus EUR transfers and travel tips. The Most Serene Republic of San Marino is a must-see destination for lovers of history—and for those who love picturesque panoramas. A sole survivor of Italy's once powerful city-state network, this landlocked micronation clung on long after the more powerful kingdoms of Genoa and Venice folded. And still it clings, secure in its status as the world's oldest surviving sovereign state and its oldest republic (since AD 301). San Marino also enjoys one of the planet's highest GDP per capita. 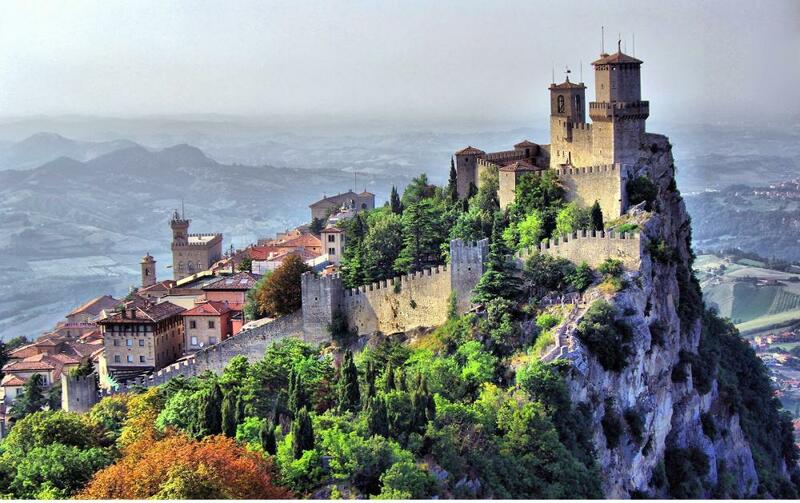 San Marino is a mountainous microstate surrounded by north-central Italy. Among the world’s oldest republics, it retains much of its historic architecture. On the slopes of Monte Titano sits the capital, also called San Marino, known for its medieval walled old town and narrow cobblestone streets. The Three Towers, castlelike citadels dating to the 11th century, sit atop Titano’s neighboring peaks. What currency should I use in San Marino? San Marino uses the euro and has a well-developed banking network. You should have no problem finding an ATM - which might also be marked up with the word Bankomat - in the cities in this tiny country. However, if you’re headed off the beaten track, then carry cash. ATMs can be found in bank branches, in shopping centres and near supermarkets. Find the most convenient location for you, using one of the following ATM locators from national and regional banks. How to get around in San Marino? Whether as a day trip or weekend getaway, San Marino is easily reached from central Italian cities like Rimini (30 mins), Bologna (1.5 hours) and Florence (2.5 hours) by bus or rental car. Hopping over from Italy to San Marino is quite easy: There is no border control, so you don’t need your passport to enter… but you can ask for a stamp in the tourist department as a souvenir! The local currency is the Euro and the official language is Italian, although most shops and restaurants speak English. Bonelli Bus and Benedettini operate 12 buses daily to/from Rimini (one-way €5, 50 minutes), arriving at Piazzale Calcigni. The SS72 leads up from Rimini. 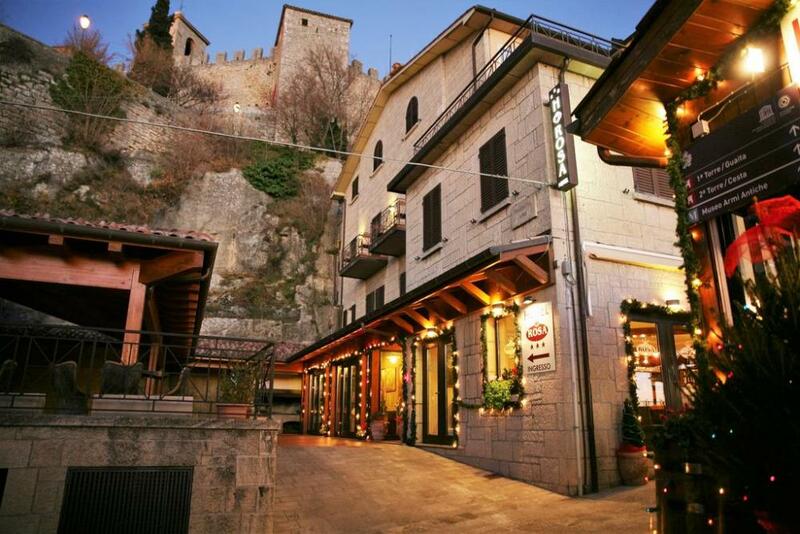 Leave your car at one of Città di San Marino's numerous car parks and walk up to the centro storico. Alternatively, park at car park 11 and take the funivia. In the opposite direction, the funavia leaves from next to the tourist office. The view of San Marino. Travel tips for San Marino. Città di San Marino's highlights are its spectacular views, its Unesco-listed streets, and a stash of rather bizarre museums dedicated to vampires, torture, wax dummies and strange facts (pick up a list in the tourist office). Ever popular in summertime is the hourly changing of the guard in Piazza della Libertà. A Multimuseo card (€10) is a good bargain for entrance to all of the state museums. 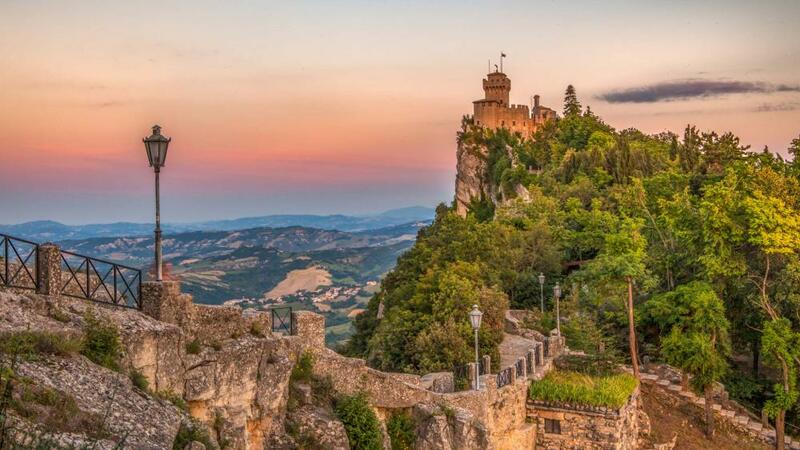 San Marino has a Mediterranean climate with warm summers moderated by sea breezes. However, in summer the streets are clogged with visitors, especially on the weekends. In winter, the republic’s high altitude (it is built on the Apennine range) ensures it sees a sprinkling of snow. Visit on 9 September and you will be treated to a crossbow tournament held to celebrate the anniversary of the republic’s foundation. The Mille Miglia classic car rally from Brescia to Rome usually goes through San Marino in mid-May. The historic streets of San Marino. When searching around for information on how to get a good exchange rate when sending money to San Marino you need to start with finding out the latest Euro foreign-transfer exchange rate. Once your funds are received by the provider the converted EUR amount will be transfered to the recipient account you specify in San Marino.